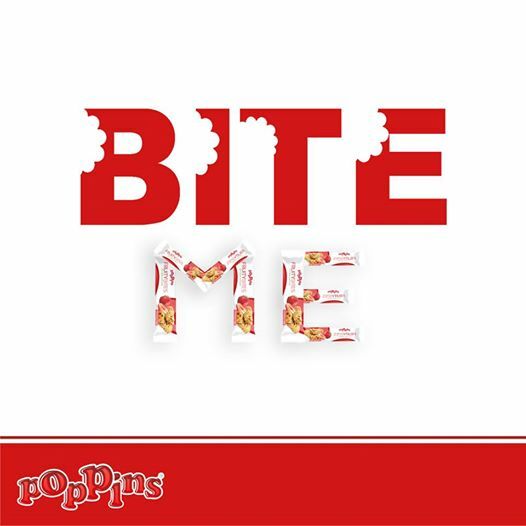 It’s been a few weeks since Poppins, the local breakfast cereal company, launched its new range of cereal bars with fruit pieces, adequately called “Fruity Bites”, accompanied by a huge online and offline ad campaign to promote the new bars. Let me start by stating that this post in no way criticizes the product itself. I am writing this post to shed the light on the slogan of the Fruity Bites’ ad campaign. The campaign’s slogan is “Bite Me”. Yeah, just like that. Every time I watch Fruity Bites’ TV commercial I feel outraged. The voice of a man introduces himself as either one of the different fruits from the different flavors of the cereal bars, and then goes to say “Bite Me”. Not only does it say “Bite Me”, but the word pomegranate is also spelled incorrectly. This commercial is downright traumatizing. The odd thing is that we have the exact same expression in the Lebanese dialect, and it means the exact same thing. Frankly, I’m too ashamed to write the Arabic equivalent, but I’m sure you already guessed it if you’re Lebanese and you’re reading this. This is the exact opposite of the actual message that Poppins wants to convey to their customers, which means the company failed in its mission. The damage is already done, but I hope this will be a lesson for their future projects. Now good luck changing people’s impression! THANK YOU! Let’s use this platform to come up with a nice slogan for their Campaign. Anything works better than “bite me”.